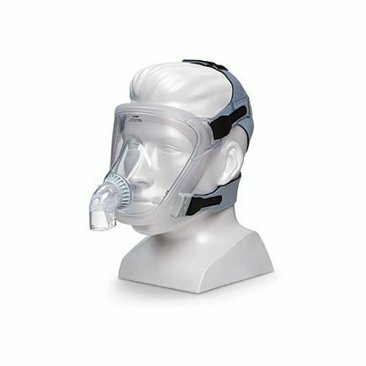 The Fitlife Total Face Mask is a great solution for patients who have difficulties with conventional CPAP masks. Patients with facial hair, dentures, or facial irregularities may experience trouble wearing some types of CPAP masks due to difficulties maintaining a proper seal or discomfort from pressure points. The FitLife covers the entire face and forms a seal around the less pressure-sensitive facial perimeter. This clear full-face mask offers a complete field of vision, which makes the Fitlife a great mask alternative for patients who feel claustrophobic with other kinds of masks. The headgear is easy to use and features EZ Peel tabs that allow the patient to make quick adjustments to the mask to form a stable seal. Once adjustments are set, the headgear can be separated from the mask using snap clips. The fitting adjustments can be preserved to ensure that the user gets proper, consistent fitting every single time. 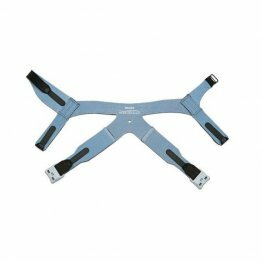 A soft silicon cushion forms a perimeter seal that is designed to fit quickly and evenly. The seal forms around the less sensitive facial perimeter, so patients who have experienced discomfort on the bridge of their nose from other kinds of masks will find the Fitlife a welcome relief. Exhaled air is quietly diffused away from bed partners through vent ports built into the mask’s elbow. It is always reassuring to the mask user to know that their therapy will not disturb the sleep of their bed partners. If the air pressure drops below 3 cm H20, the entrainment valve is triggered to access room air. Patients who suffer from obstructive sleep apnea (OSA) experience blockages in their airways when they sleep. This is caused by relaxation of the airway muscles during sleep, which can cause the airways to close off. Patients are awakened and their sleep is disrupted when they experience a lack of air. Positive airway pressure applied to the airways can keep the airways open and allow these patients to get an uninterrupted night of quality rest. A quality comfortable mask is important for the efficient delivery of CPAP for the treatment of OSA. If you are a patient searching for an alternative interface to more conventional masks because of fitting issues due to facial hear or pressure soreness on the bridge of the nose, it is worth looking into the FitLife Total Face-mask.